Gnoll Mountain is a mountain and campsite east of Bruma (quest-related). This campsite is set high in the Jerall Mountains and consists of one tent and a fireplace with a pot of food cooking over it. Between them is a barrel full of food and nearby the ground is strewn with different types of meat. The purpose of the meat becomes clear during the Dark Brotherhood quest The Coldest Sleep, when the camp is inhabited by Havilstein Hoar-Blood and his pet wolf, Redmaw. At all other times, Gnoll Mountain is devoid of life. The landmark given for Gnoll Mountain is near the tent and the fire. 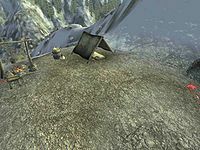 The Gnoll Mountain campsite is possibly the most elevated travel point within Cyrodiil's borders, and a moderate climb from it leads to one of the highest peaks, as well. This can be a good place to practice Acrobatics if you have a lot of health, and a beautiful vista if it is not snowing, as it frequently is. Surrounding this peak are several unmarked and abandoned temporary campsites including fire pits, a chest and a sack cloth purse with random miscellaneous supplies in them. At the summit is an abandoned temporary camp with a burned out fire pit, a flag pole with the flag torn from it, and cloth sack half buried in snow with random miscellaneous supplies. Also half buried in snow is a bottle of Tamika's West Weald Wine which is unnamed and cannot be carried or drunk, though it can be picked up and manipulated as a physical object, presumably because it is either empty or frozen solid. With the Wizard's Tower Official Plug-in much of the summit and the summit camp are replaced by Frostcrag Spire, which becomes the most elevated travel point. In the tent there is a grey robe and the ultra rare grey robe hood. This page was last modified on 20 April 2018, at 20:30.